There is one church in the city. We belong to the same cause, the cause of Christ. We will say No to competition, jealousy and speaking ill of other congregations. We will bless each other. Our focus will not be our own congregations but the Kingdom of God. We will pray and serve and work together because our community needs to see this. We will pray and serve and work together because we can do together things that we cannot do alone. We will pray and serve and work together because this pleases Jesus Christ. We will create a rhythm of community wide worship and prayer, beyond the 21 days, that fuels our collaboration. We will collaborate to address the deepest needs of our city. We will collaborate to reach the lost and un-churched of our city with the gospel of Jesus Christ. We will sacrifice some of the smaller things in our local congregations’ budget and calendar to create space for collaborative mission. We are committed to serve and minister in and to our community presenting ourselves as a united body of Christ for the glory and honor of our lord Jesus Christ. It is our hope that we will be used by God to eliminate the desperate needs in our community through which lives will be transformed. One Mission congregations commit to this effort even if not one new person joins their individual church. Affirm the One Mission Purpose Statement and communicate that to the congregation. 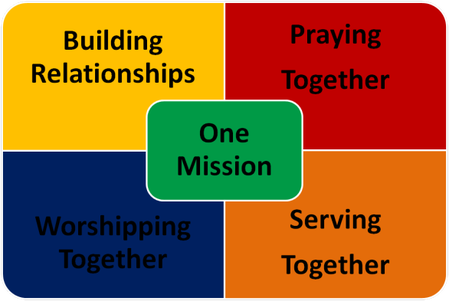 Communicate One Mission Activities and Events within your Congregations as if they were your own. Encourage sharing of best practices and learning’s.